A radar device provides an image of the traffic situation on water ways that is nearly independent of light and weather conditions. Reliable and fast sensor processing is fundamental for a comprehensive traffic survey and is, therefore, the basis of all components of the inRVN (Radar Video Network). The proven modules of the inRVN cover all necessary tasks from data acquisition, calibration, processing, filtering, multiplexing, tracking and distribution, through to archiving and image data presentation within characteristic applications. A state-of-the-art PCI- or PCIe PC Card, the RADAR interface acquires radar information and the RADARserver makes the information available within the network. 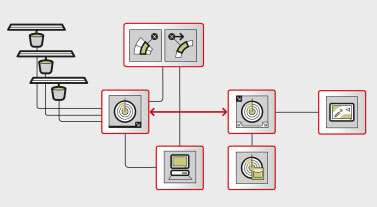 Radars from different manufactures can be connected. Additionally, project specific requirements can be implemented by hardware extension boards and configuration parameters of the software. A sophisticated extended Kalman filter algorithm, in combination with a mature movement model, guarantees reliable tracking performance. Components for MultiSensor processing provide an incomparable traffic image. The modular design of the inRVN allows scalability and integration of further functions into a system. Small straightforward systems – moving or stationary – using a few software components on a simple hardware setup can easily be implemented. On the other hand, complex and highly redundant and distributed systems can also be realized using the same components, as is mandatory for coastal surveillance systems. Theses software modules are designed to work on industry standard operating systems and computing platforms, ensuring that systems can be upgraded and maintained over their operating life.